The dream carriage of many, it is the one aspect of the night guaranteed to be a success. Calling Bergen Limo to sort out the ride is easy, so what else do you need to consider for the big day? Below we highlight some aspects of the party you may want to ponder when the time comes to putting it all together. An event of almost military scale planning, it is crucial to establish the when and where of it before delving too deep into other details. Ideally it should take place on the day of the birthday or a weekend, but with that in mind you must be sure that all the main desired attendees are available at that time. Obligations such as school work, job commitments, and even other family events might need to be considered. If the actual birthday date is too impractical then just be sure that the day of the party is not too distant from it, or it may lose some of its excitement. Family politics aside, another important facet to consider is the permissions from parents. Although you may be turning 21, many of your friends may not have, so some thought might need to be given toward the presence of alcohol. The amount of tasks necessary for celebrating your 21st birthday can seem endless. Choosing a theme, selecting and hiring a band or DJ, picking out decorations, sending out invitations, and possibly hiring a professional photographer to capture you at your youthful adult best are just some of the things that need to be considered. Also, a large cake needs to be baked and decorated, as well as general catering sorted out with all allergies and diets taken into consideration. At least the limo won’t be a hassle. Even when the event is taking place at home, a limo ride has become one of the most desirable aspects of a successful 21st birthday party. Representing the passage from childhood into adulthood, in years to come the opportunity to look back at a photo of yourself stood next to a pink limo during your most monumental birthday will recall one of your most precious memories. By booking a Bergen pink limo early you can rest easy that at least the traveling part of your night is a guaranteed success. With so much to fret over getting right for the big day, why wouldn’t you want one of the simplest of chores taken care of? Not having an organized party for your 21st birthday? Then nothing can match the chaos and excitement of a night on the town with your friends traveling from bar to bar in a pink limo. You’ll be the talk of the town! 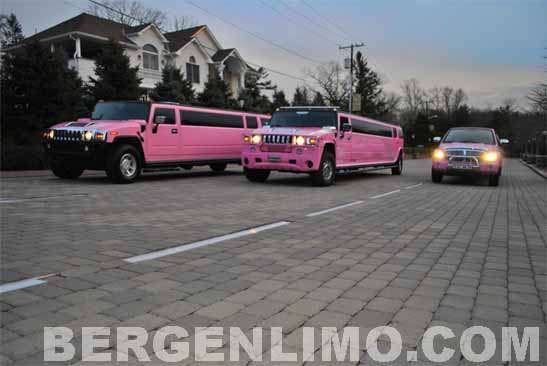 Ease the burden and secure your booking of a pink limo rental by calling us on 1-201-703-7979 today.